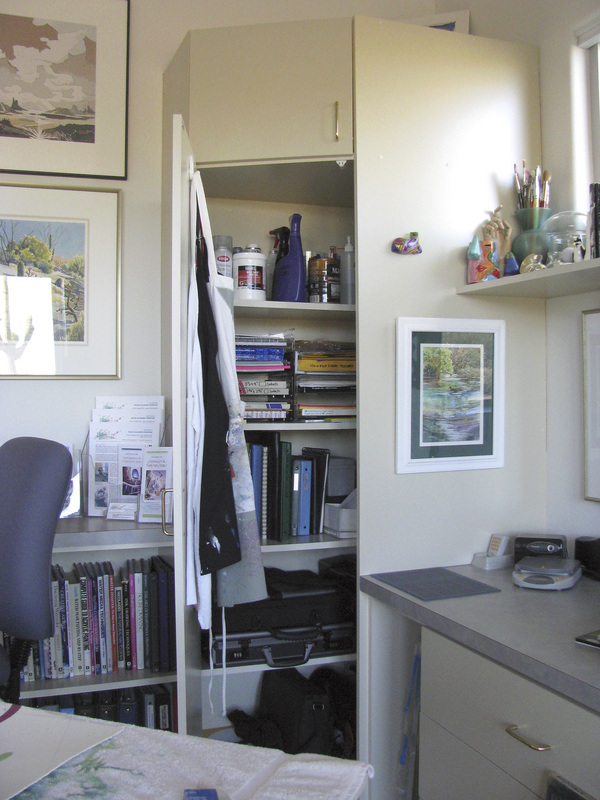 When I was in college, my work space for painting was a 3x8 foot second hand door - minus the handle - set on top of a couple of used 2 drawer metal file cabinets. 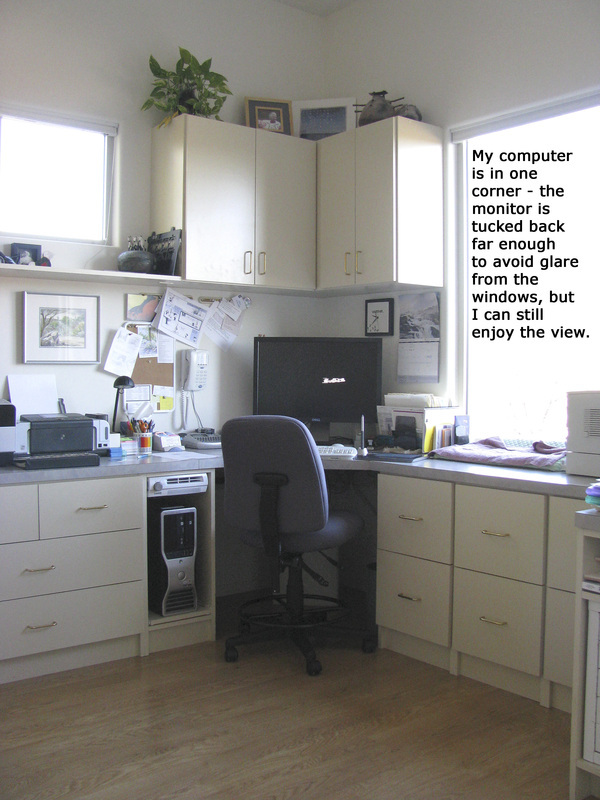 I shared the space (a 10x12 foot second bedroom) with my husband who had the opposite corner for a desk, chair and what he needed for his home office and study space. The room had one high north-facing window. 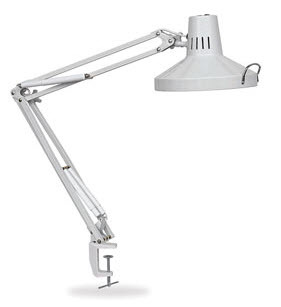 My one splurge was a good "daylight" swing arm, height adjustable lamp that could be clamped to the edge of the door/table so that I had good light to work by, even at night. 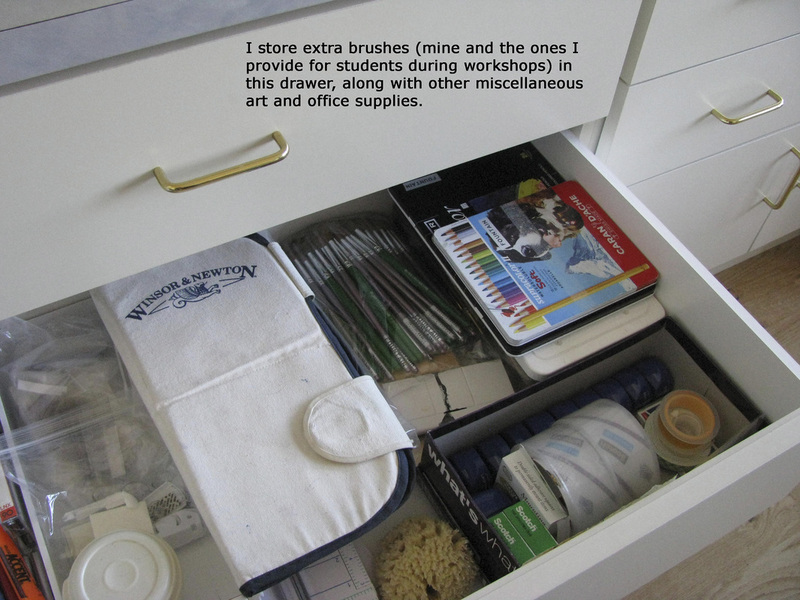 I kept my art supplies in the file cabinet drawers and in a tall bookcase I shared with Jim. My point in telling this story: You don't need a huge, fancy studio, but if you want to develop a regular PRACTICE of making art, it is very helpful to have a place to work other than the kitchen table. A place where you don't have to put away a half-finished painting in order to eat a sit-down meal, do paperwork, or provide a place for kids to do their homework. 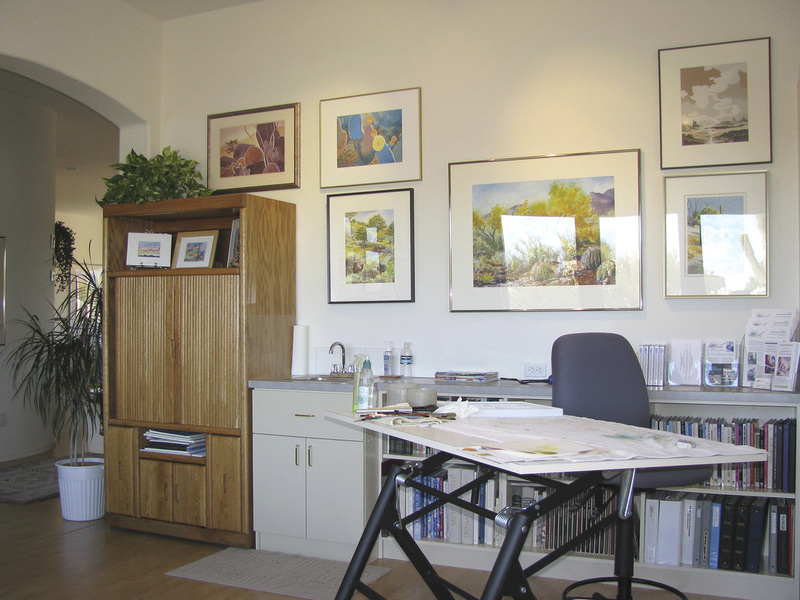 A "studio" can be as small as a converted closet or as large as a converted garage (or larger), but whatever the size, ideally it will be for the sole purpose of making art. My current studio space is in what would be a formal living room in some homes, located just inside the front door. 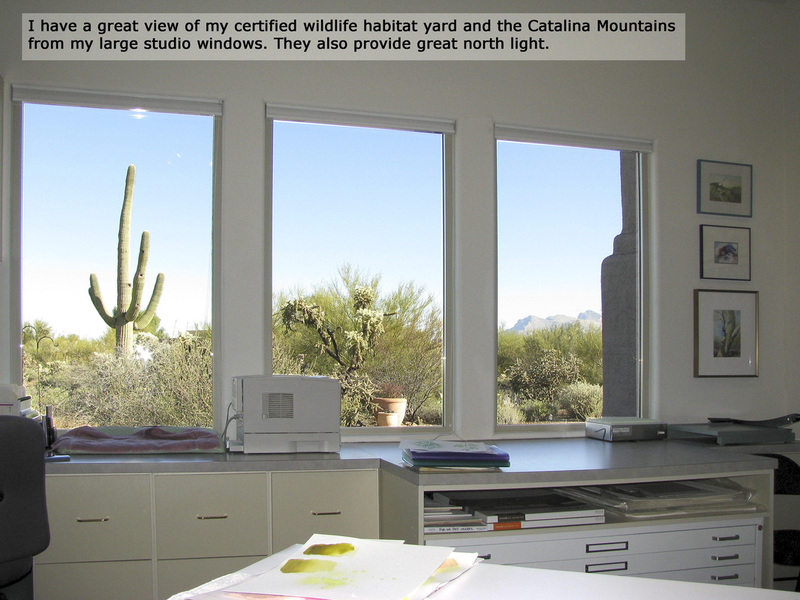 It's ideal, because visitors don't have to go through any other part of the house to get into my studio. 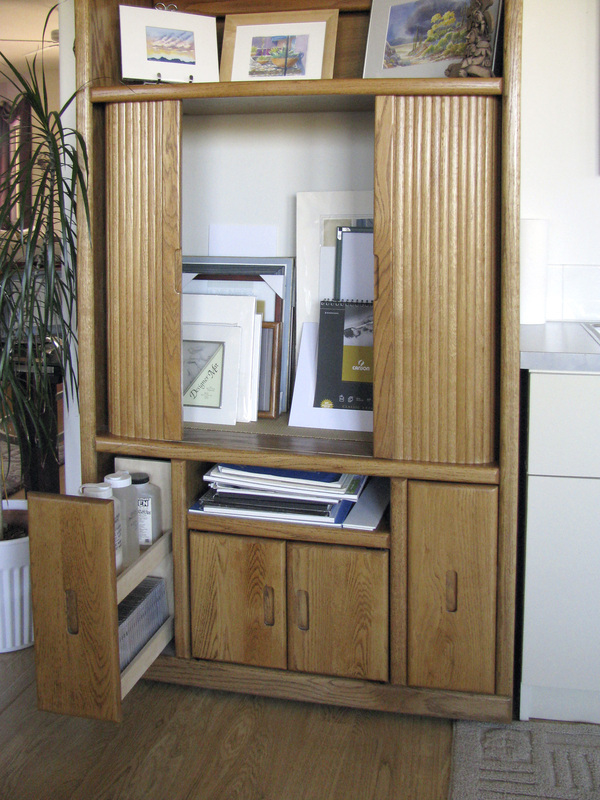 I had built in storage installed along three walls, and am also utilizing an old oak TV armoire to hold small framed paintings, watercolor blocks of paper and other art supplies. 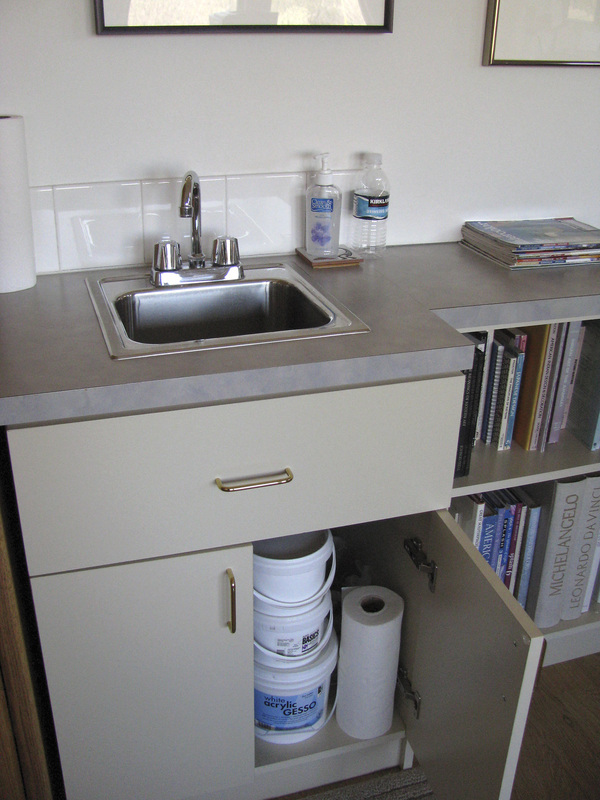 A small bar sink next to the armoire is very handy for cleaning my watercolor brushes and refilling water containers. Track halogen lights provide extra light, and my large windows face slightly west of north, so there is a good natural light source as well. 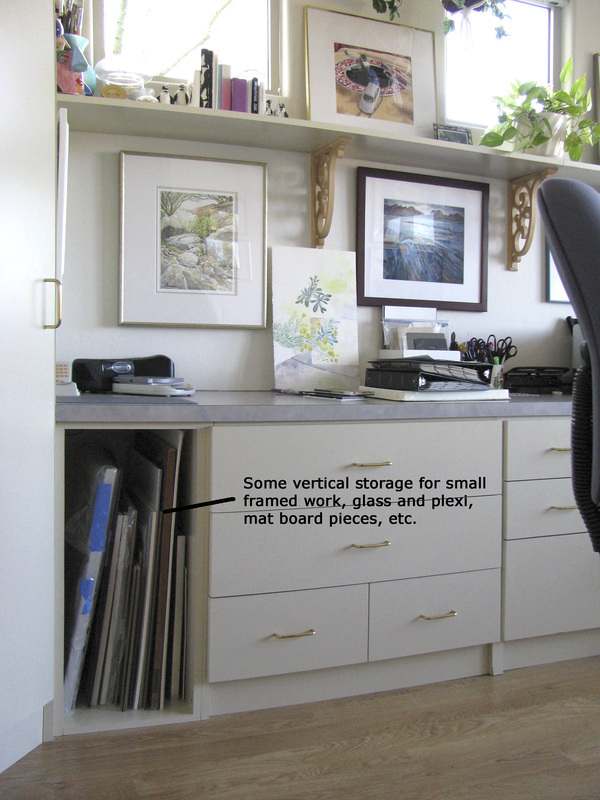 Vertical storage for smaller framed paintings, foamboard, plexi, etc. is very handy. 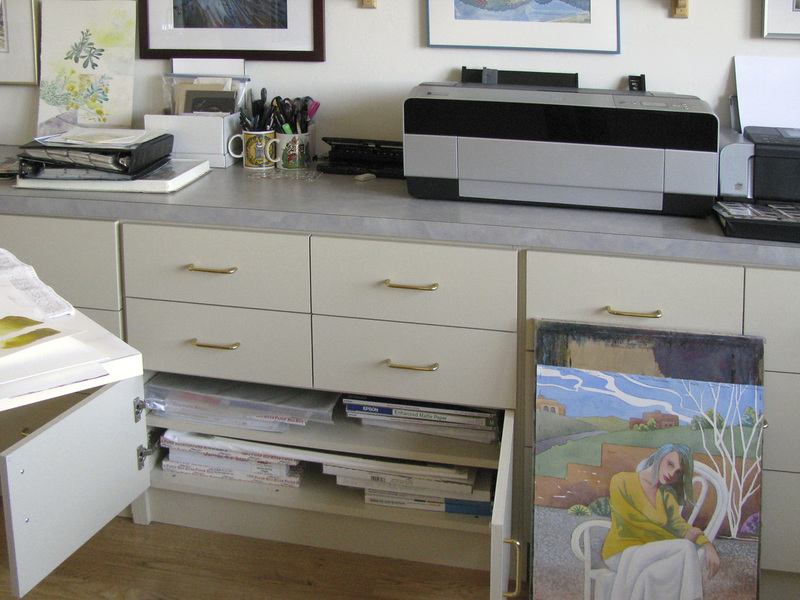 Digital painting is one of my mediums, so I need a place for my professional Epson printer, and all the various archival papers I use to print on. If finding time to make art is an issue, use what time you have for making art, not searching for your supplies. I have all my supplies organized and accessible. The computer workspace is in one corner of the studio. 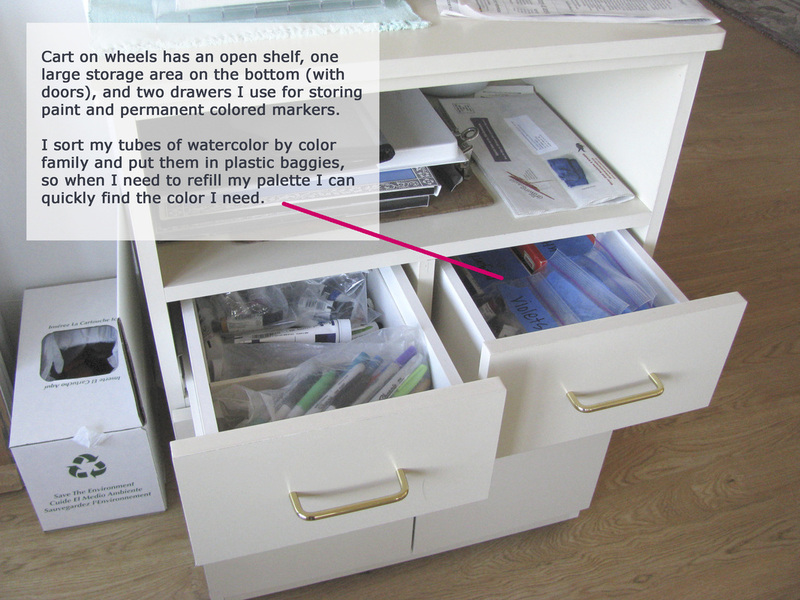 Six letter size file drawers are to the right of the computer, between it and the large flat file. A large flat file and a second storage cabinet complete the area next to the letter files. 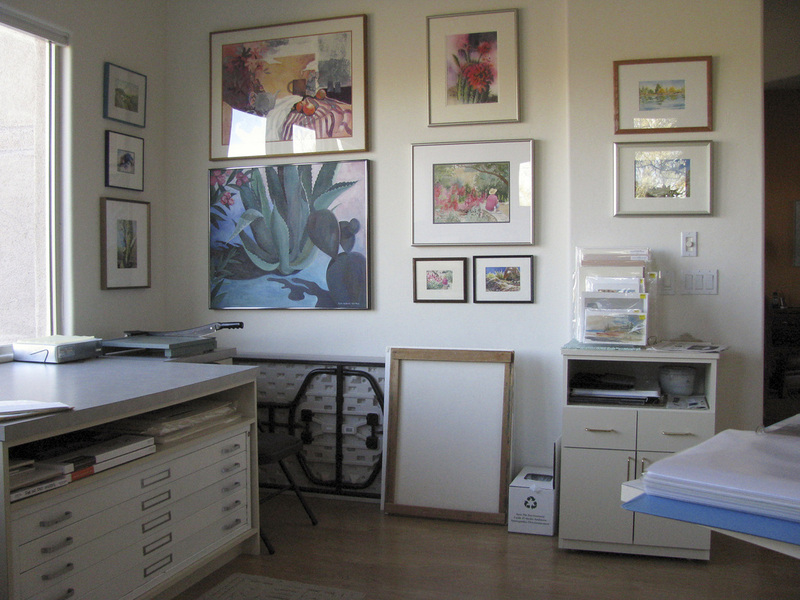 A shelf above the flat file brings the counter top level with the rest of the counter space, and gives me a large flat area to show unframed work to studio visitors. 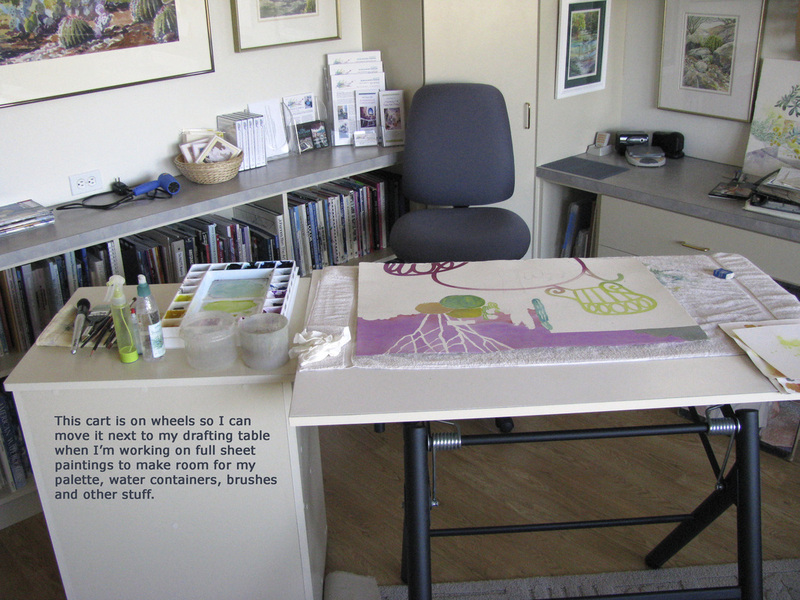 Next to the end cabinet, there is space for storing watercolor boards, larger framed paintings, and a couple of 3x6 folding tables I use when I need extra table surface. I have enough wall space to display a rotating exhibit of finished work. One of the most useful pieces of furniture in the studio is the rolling storage cart shown at the right in the photo below. It has an open top shelf large enough to store my painting palette and/or blocks of watercolor paper and my water containers, plus cabinet storage below. 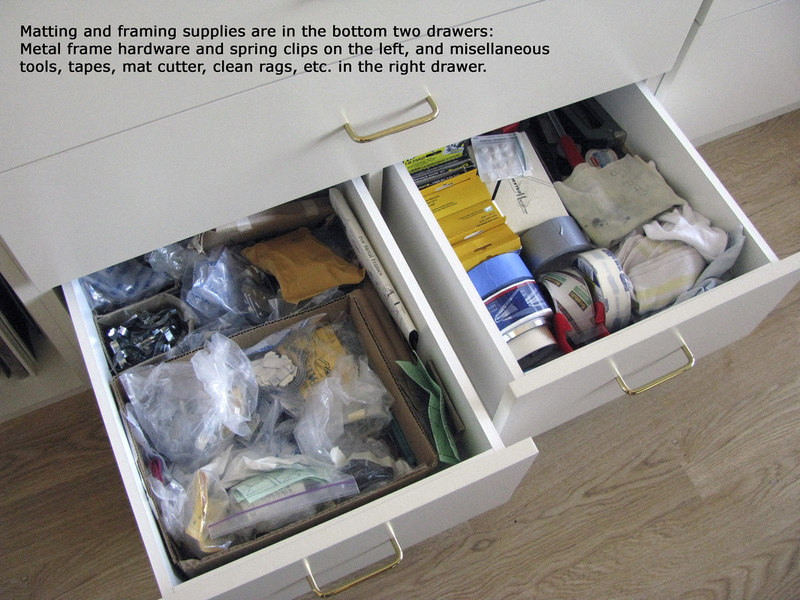 When I am working on a large painting and need more surface than my adjustable drafting table has, I can roll this cabinet up next to my drafting table, and put my palette, water containers and brushes on the top, leaving plenty of room for my stretched watercolor paper and board. I couldn't ask for a more pleasant place to work! Large windows face the front yard and towards one side, the driveway and street. There is enough counter and high shelf space for the cats to lounge around and watch what's going on outside (and keep me company). I don't need any artificial light during the day, but can always turn on the overhead track lights if I want to see how a painting will look under artificial light. My drafting table surface can be tilted to a variety of angles (for letting paint run in a more controlled way) and is height adjustable as well. I prefer to paint standing up, and I'm tall, so having a higher table surface keeps me from stooping over for hours on end. I also have adjustable drafting chairs for both the computer and the drafting table when I need to work sitting down.